Set of 1 dozen micro-mini babies. A great variety of dollhouse miniatures. babies wearing pink diapers. THIS COLLECTOR'S ITEM IS A SCALE MINIATURE NOT INTENDED FOR USE BY CHILDREN UNDER 14 YEARS OF AGE. Dollys Gallery. Rancher Nicole. Dollhouse Miniature Doll Young Girl with Egg Basket. by Safari Ltd. Doll is made of Plastic. Dollys Gallery. 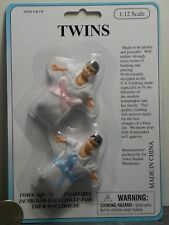 Dollhouse Miniature Doll Baby Twins Set. Doll is made of Plastic. Doll is poseable. Dollys Gallery. Dollhouse Miniature Doll Girl Little Sister. Doll is made of Plastic. Doll is poseable. This darling pair of dolls both close their eyes when laid down! They have moveable joints. They are made of a delicate plastic, and are from the 1950s, with colorful clothes and headscarves. The ribbons and scarves are glued on. 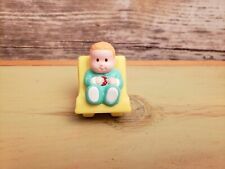 Vintage Baby Figurine Geoffrey Inc 1999 Plastic Dollhouse Toy Cake Topper - 1.5"
2 micro-mini babies 1 baby in blue diaper 1 baby in pink diaper set of 2 approx 1.25 in. tall not poseable These tiny toys are made of soft flexible plastic, highly detailed, artfully painted and measure about 1.25 in. long. A welcome addition to any miniature toy box or toy room. THIS COLLECTOR'S ITEM IS A SCALE MINIATURE NOT INTENDED FOR USE BY CHILDREN UNDER 14 YEARS OF AGE. Set of 1 dozen micro-mini babies. A great variety of dollhouse miniatures. These tiny scale toys are made of soft flexible plastic, highly detailed, artfully painted. THIS COLLECTOR'S ITEM IS A SCALE MINIATURE NOT INTENDED FOR USE BY CHILDREN UNDER 14 YEARS OF AGE. DOLLHOUSE MINIATURE. TOWN SQUARE MINIATURES. Hard plastic doll in traditional German dress. Unknown maker. Unknown origin. Very good condition. A great variety of dollhouse miniatures. These tiny scale toys are made of soft flexible plastic, highly detailed, artfully painted. THIS COLLECTOR'S ITEM IS A SCALE MINIATURE NOT INTENDED FOR USE BY CHILDREN UNDER 14 YEARS OF AGE. 1in to 1ft. 1:12 Scale. This is sized for a dollhouse. Set of two babies for your miniature scene. Babies are dressed in white shirts and wrapped in white blankets. Hair is painted on. Vtg Dollhouse Miniature Baby w/ Sleep Eyes in Christening Gown Hard Plastic 2"
Beautiful dollhouse miniature 2" hard plastic baby in a Christening gown. baby is wearing a cloth diaper. baby has sleep eyes. One is more pink and the other more peach. The pink one is marked, "Made in Hong Kong" on the back. No breaks or bites.The pink one has a few little black specks on it that are able to be flecked off. Super cute! She is made of a delicate old plastic. She looks great in a dollhouse! This darling pair of dolls are from the 50s. One of them is blind, with cherries on her skirt, and the other closes her eyes when laid down! They have moveable joints. They are made of a delicate plastic, and are from the 1950s, with colorful clothes and headscarves. 1in to 1ft. 1:12 Scale. This is sized for a dollhouse. ONE Plastic baby doll in crocheted outfit for your miniature scene. Doll has no moving parts. My Dolly's Babies. Doll: 1 1/4" H x 1" L. -Made in Hong Kong. -4 Plastic Dolls. Marked: "ES (Emil Schwenk) Germany " on back. This cute baby doll would be a wonderful addition to any collection of miniature/ dollhouse dolls. Jointed, sleep eyes. Alden Industries circa 1940s. each baby is about 1" tall. 4 plastic babies in sitting positions with. Sorry but e-checks are no longer accepted. My Dollys Babies. card is about 4.5" x 5" x 5". It is my intention to be fair and honest because that is how I was raised. The arms and legs move. Clothing is crochet. I don't see any markings on her. Marked: "Edi" ( Eric Dittman ). Tiny and super-cute, the dolls would be a treasured addition to any miniature doll collection. Celluloid 5-1/2" Doll House doll made in Italy. Plastic, moulded, marked:"Hong Kong". Articulated and posable. 3 have "sleepy eyes" that work. One boy is missing his eyes. Dolls are about 3.25" tall. They have painted - on socks and shoes. Anatomically correct baby girl crawling. Made of a soft plastic/rubber material and sets 1" high X 1 1/2" long.They are not as anatomically correct as they used to be, but still boys and girls. Miniature Dollhouse 1" Scale. She is in very good condition, she has a white dot on her face. Her arms are glued down but her legs move. Her dress is a Christening Dress and very long and obviously hand crafted. She's very cute. SLEEPING BABY SUCKING THUMB 1.5", SITTING CRYING BABY WITH OUTSTRETCHED HAND 1", & LIFTING HEAD INFANT ON TUMMY 1.5". Dollhouse Miniatures Doll in Swiming outfit; H 3 1/2"
Beautiful little doll in swiming suit;. Movable head, legs and hands. I work hard to make sure EVERY. Yellow swimming suit. white teeth. VERY SOFT RUBBER-FEEL. FOOD-SAFE, CAN BE PLACED ON A BABY SHOWER CUPCAKE. SHE HAS BLONDE HAIR & BLUE EYES. FLEXIBLE PLASTIC. SHE CAN STAND ON HER OWN. 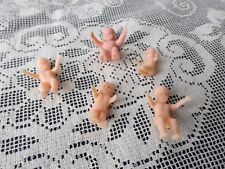 Grouping of 5 plastic dollhouse babies for the miniature collector. All for one price. Their stringing is slightly loose but not too bad. Probably loser so they are easier to pose. Refer to pictures for further condition. Thanks! Sold as is. CRAWLING BABY IN PINK. This product is a 1:12 scale miniature and not intended for children under 14 years of age.